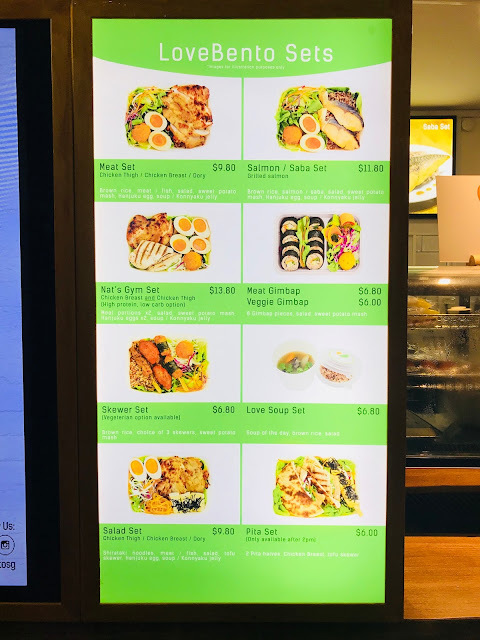 My colleague came back from lunch one day and exclaimed to me: “ There is a new food court at Shaw Tower. You should go and try it. 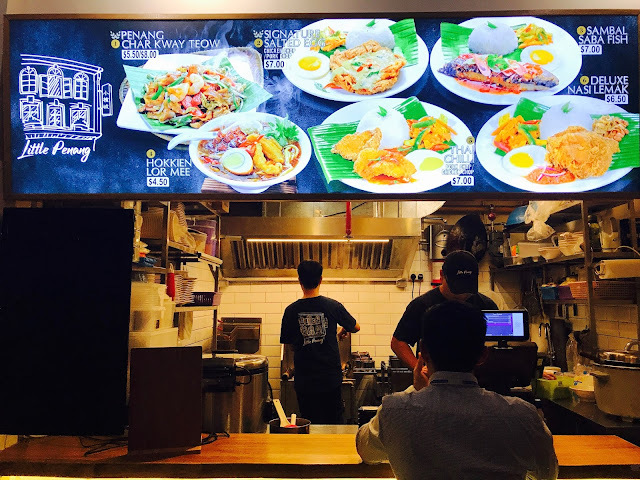 I think you will like it very much!” I went and I fell in love with the “atas” (Singlish for “upscale”’or “high class”) food court and I made over 10 trips to Wild Market to try out all the 8 stalls. I present to you the 8 stalls of Wild Market. 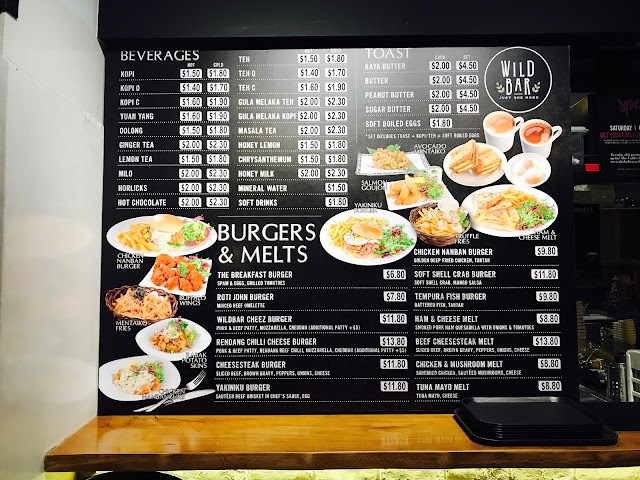 This is the first stall you are going to see if you enter Wild Market from the glass door located at the back of Shaw Tower. 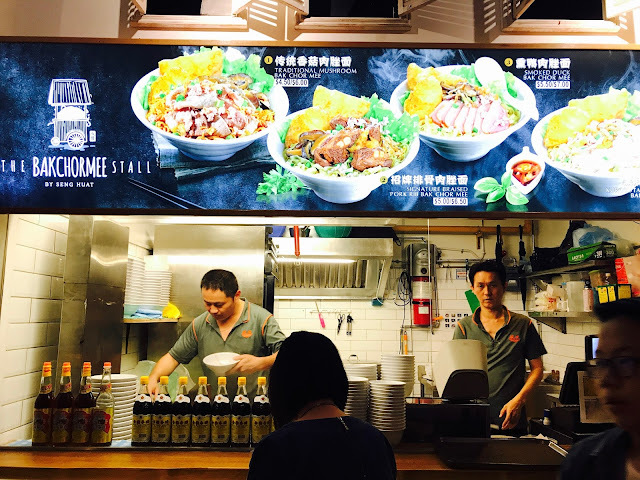 Don’t just dismiss this stall as “just the drink stall”, as they serve burgers, toasts and sides too. 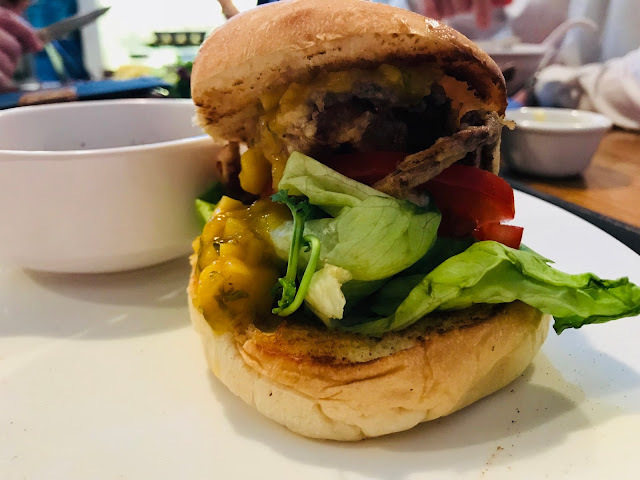 I wasn’t impressed with the Soft Shell Crab Burger [$11.80] that I had because the mango salsa has totally overpowered the soft shell crab. 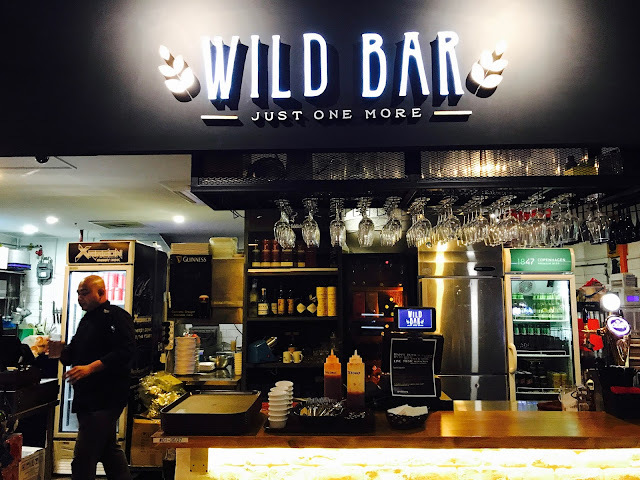 Wild Bar Cheez Burger [$11.80] might have been a better option, but you definitely should not miss out on the Truffle Fries which are cut thinly and packs a punch with the truffle oil. The BakChorMee Stall is definitely the most popular stall, which is probably because it is one of the cheapest stalls in Wild Market. There are only 4 items on the menu. 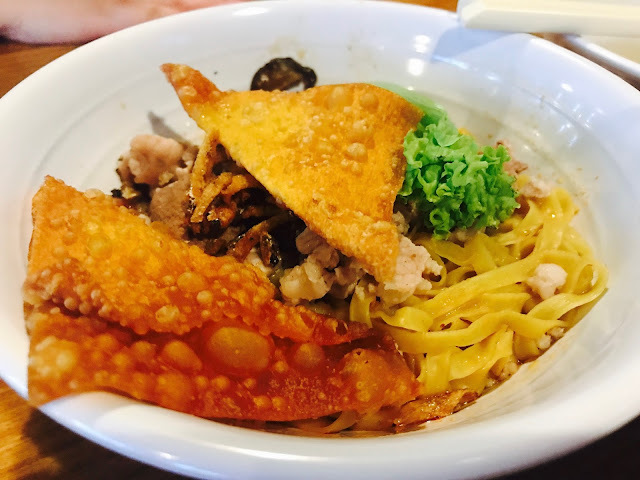 Start with Traditional Mushroom Bak Chor Mee [$4.50/$6] it is your first time having the bak chor mee here. 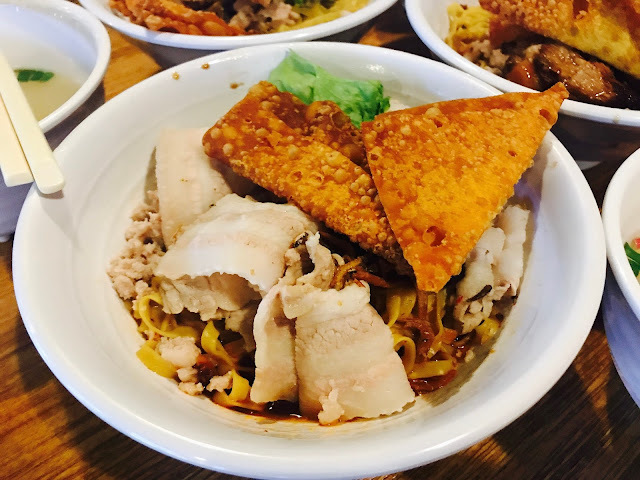 The noodles are cooked just right, not too soft and not too hard, plus the minced pork, mushroom, pork liver and two deep-fried wantons, it is every bit worth your money. 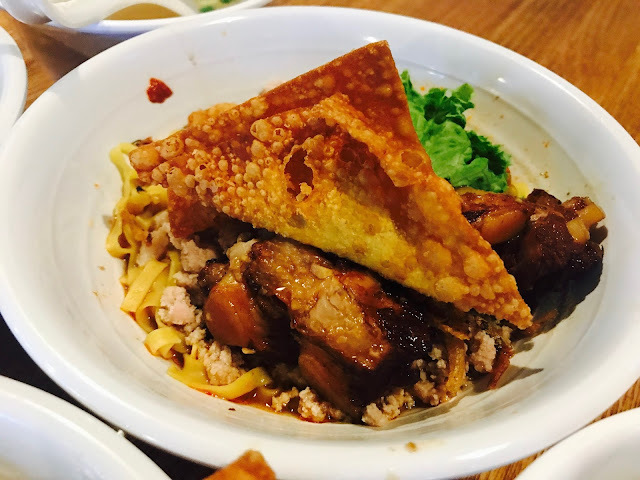 Those who like a more robust taste will like Signature Braised Pork Rib Bak Chor Mee [$5/$6.50]. 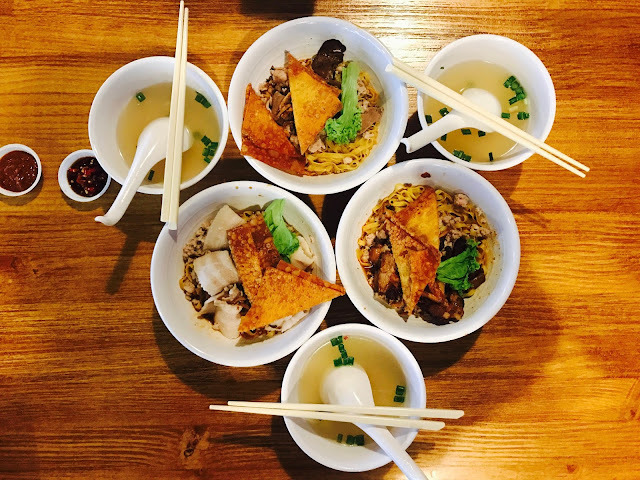 Those who want something a little more premium can opt for Kurobuta Pork Bak Chor Mee. Wokz is my least favourite of all the 8 stalls in Wild Market. 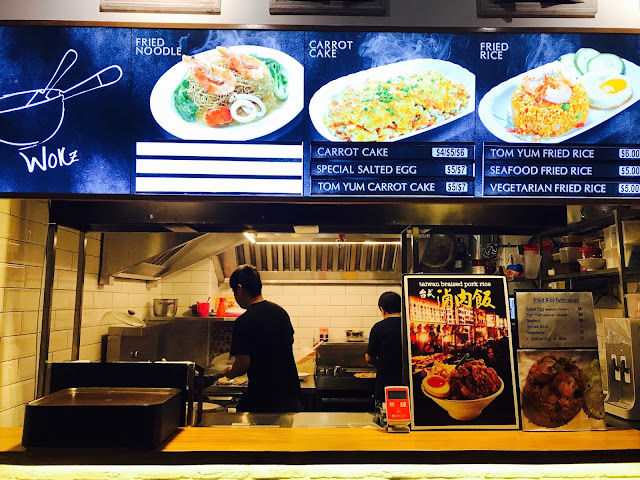 I was excited to see Salted Egg Fried Rice with a choice of Seafood or Chicken [$6]on the menu (basically anything that has “salted egg” in it automatically makes it to my “must-try” list) but I was greatly disappointed. 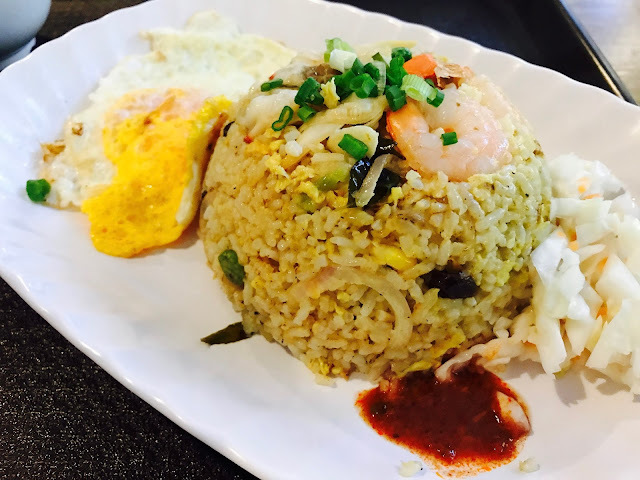 The fried rice itself is dry and bland, accompanied by a small saucer of super diluted salted egg sauce that tastes nothing like the creamy grainy sauce I had at other places. I would skip the Special Salted Egg Carrot Cake [$5/$7] if I were you because I think it’s going to be just as bad. 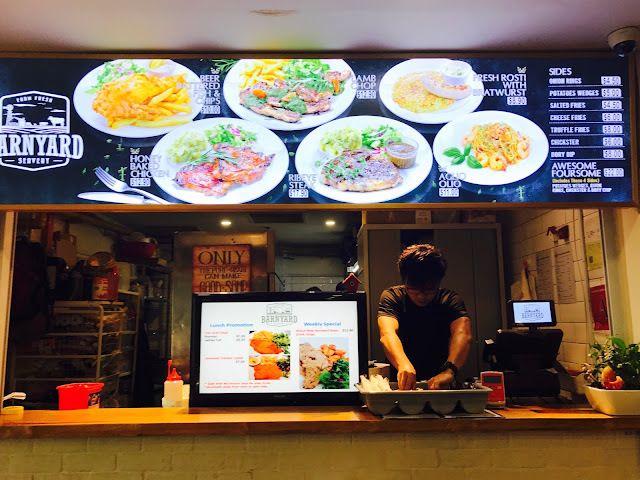 Little Penang offers a modern take on traditional Penang dishes such as Hokkien Lor Mee [$4.50] and Signature Salted Egg Chicken Chop/Pork Chop [$7]. They are pretty generous with the ingredients in the Hokkien Lor Mee. Signature Salted Egg Chicken Chop’s salted sauce is as watery as Wokz’s, but at least the chicken chip itself is well-fried with crispy skin. 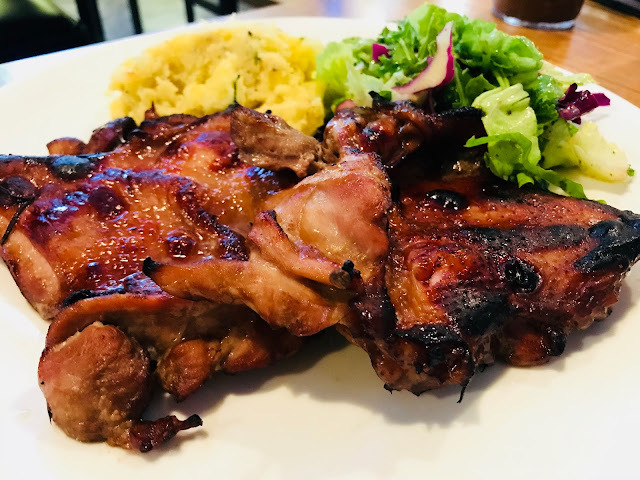 The Ceylonese Affair specializes in Jaffna food. I cannot comment on the authenticity of the food since this is the first time I am having Sri Lanka food, but it is definitely a delicious affair. Ceylonese Briyani [$10.90 for Chicken/Vegetarian; $11.90 for Mutton/Fish] comes in a metal tin container topped with fragrant briyani rice, fried shallots and hard-boiled egg. 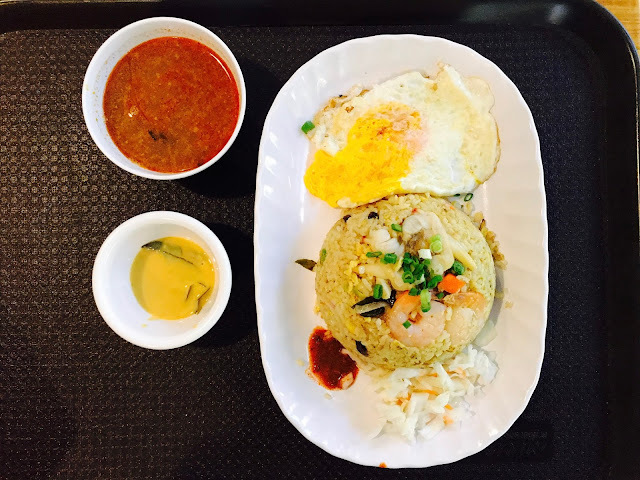 The briyani rice is infused with aromatic spices and it is not as oily as the Indian version. The mutton curry that I chose had huge chunks of tender mutton meat and the curry is tasty to boot. The mutton lover in me ordered 2 pieces of Mutton Munchies [$2.50 for 2 pieces, $6.50 for 6 pieces, $12.50 for 12 pieces] to try. 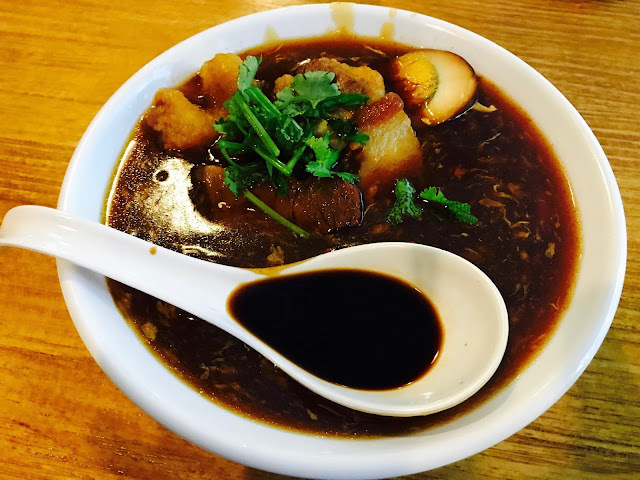 It is a little dry and the heavy use of spices covers the mutton taste that some people do not like. Appam is a type of pancake made with fermented rice and coconut milk, commonly found in South India and Sri Lanka. I ordered a Pal Appam [$3] which is the original flavour. I am not really fond of the soft sourish centre, but the thin crispy edges are like crackers and they are pretty fun to eat. 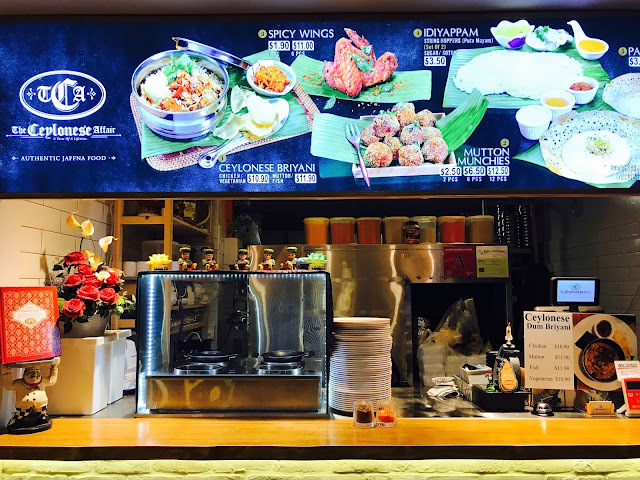 The Ceylonese Affair offers a variety of flavors when it comes to appam: Egg Appam [$3.80], Cheese Appam [$4], Banana Chocolate Crunch Appam [$5], Chilli Flakes Appam [$3.50], Peanut Butter Appam [$3.50], Peanut Appam [$3.50], Kaya Appam [$3.50] and Chocolate Appam [$4]. 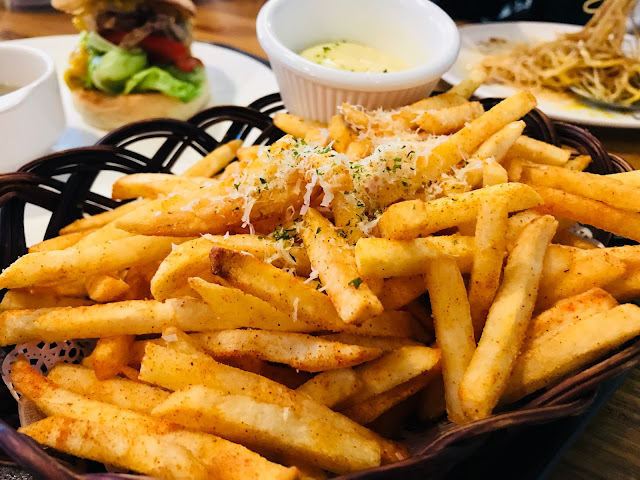 The prices are a little higher at Barnyard Servery than Western food stalls in other food courts but the quality of the food is definitely worth the extra few bucks. 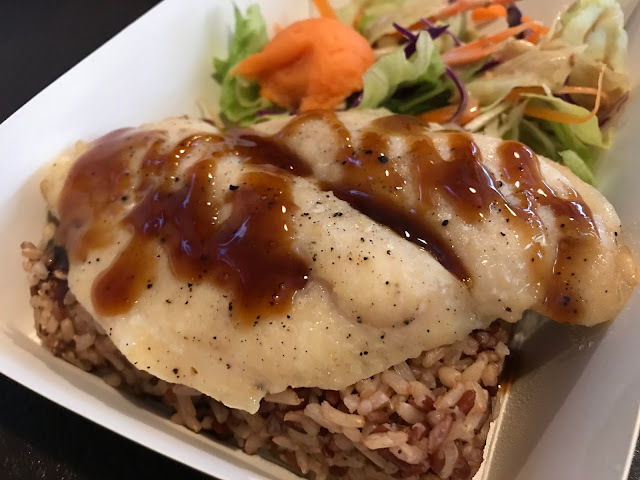 Honey Baked Chicken [$12.90] is freshly baked upon order so the honey-marinated chicken is served to you piping hot. 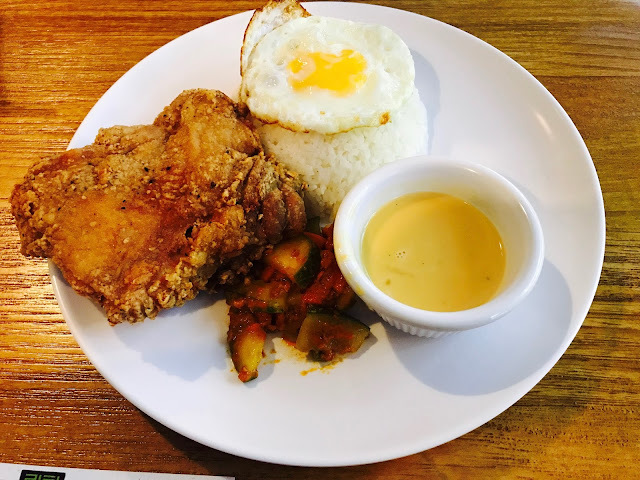 The chicken cutlet is tender and well-marinated, but the mashed potatoes that come with it is not as good as those from in Pasarbella. 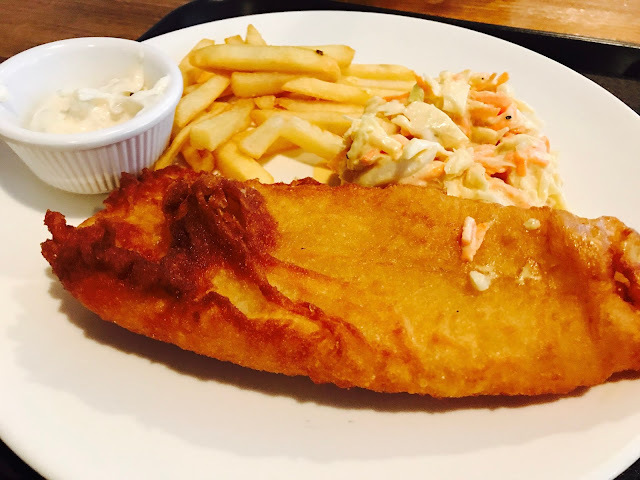 Beer Battered Fish & Chips [$10] doesn’t taste any different from fish and chips that are not beer battered, but at least the codfish is fresh and the battered fish is fried till really crispy on the outside. 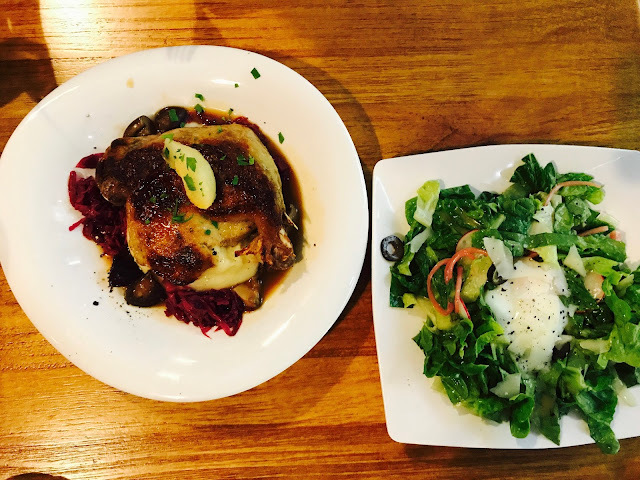 Arome serves up wallet-friendly French cuisine. 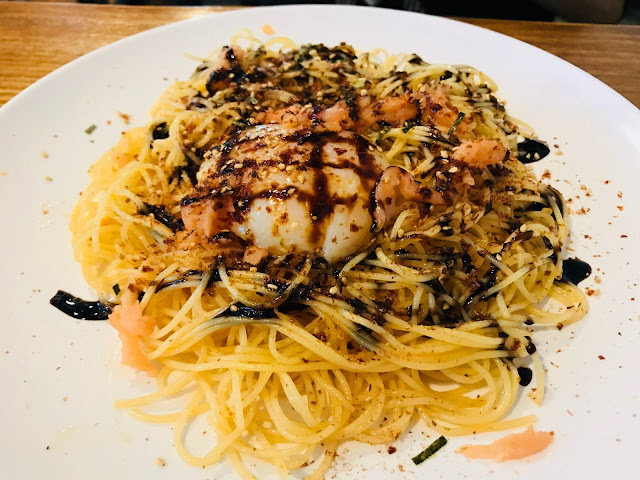 I can’t comment on the authenticity of the dishes since I have not been to France before, but there are quite a few notable dishes. I wasn’t very impressed with the Arome Pasta [$5.90 for Small; $8.90 for Large] where the pasta was undercooked. Olive Marinated Izumi [$14.90] served with baby potatoes, tomato salsa and beet vinaigrette were absolutely delicious. 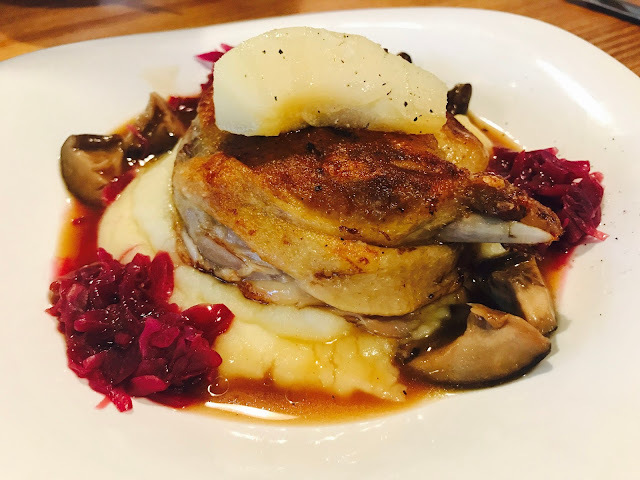 The star of the stall has to be the Duck Confit [$14.90] served with sautéed mushrooms, mashed potatoes, poached pear and house-made raspberry sauce. The duck confit has a lovely crispy skin while the duck meat inside is fall-off-the-bone tender. 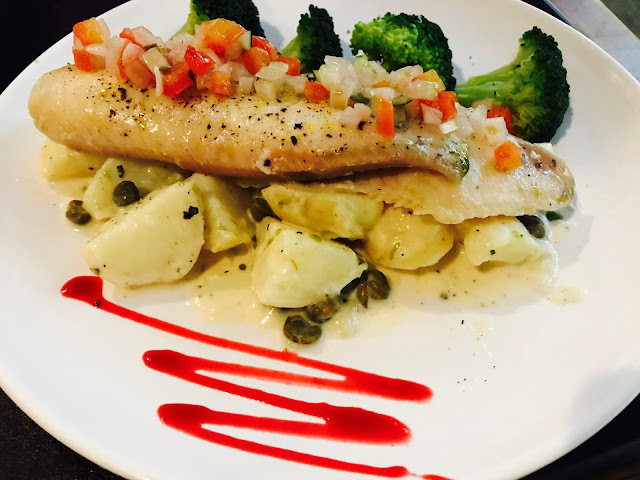 The mashed potatoes lend its creaminess while the raspberry sauce gives the dish a little tart sweetness. 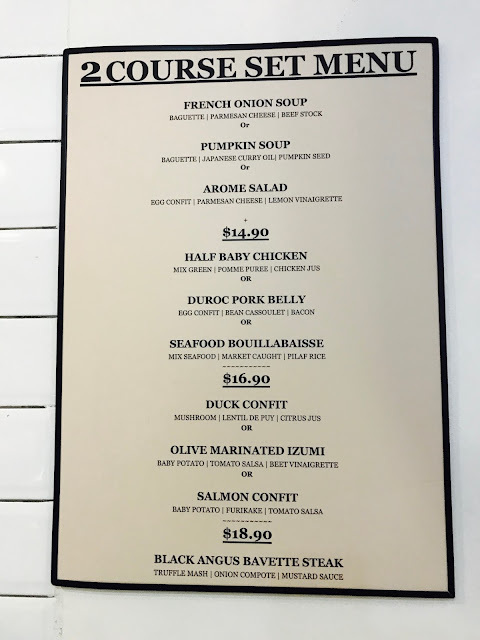 I would go as far as to say that Arome’s duck confit is every bit as good as or even better than Saveur’s duck confit. 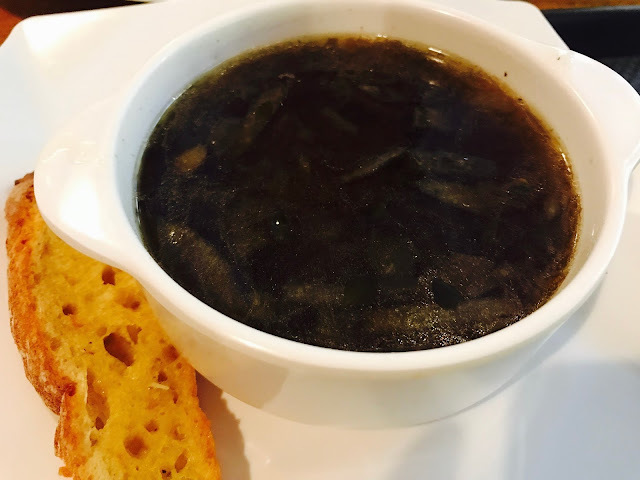 You can opt for the 2 course set meal which comes with a choice of starter: French Onion Soup, Pumpkin Soup and Arome Salad. 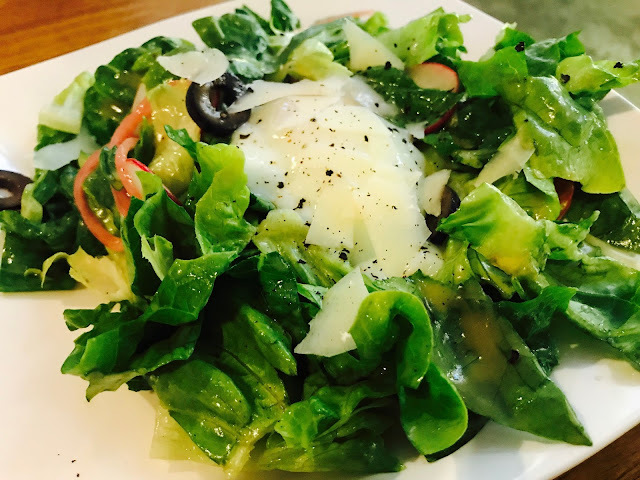 I have personally tried the French Onion Soup and Arome Salad, both are lovely accomplishments to your meal. 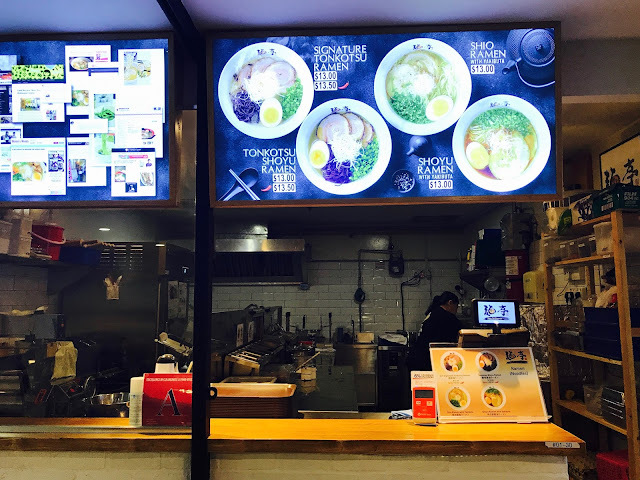 Men-Tei Express is a small branch of the popular Men-Tei Ramen which made a name for itself by serving quality ramen with homemade broths. 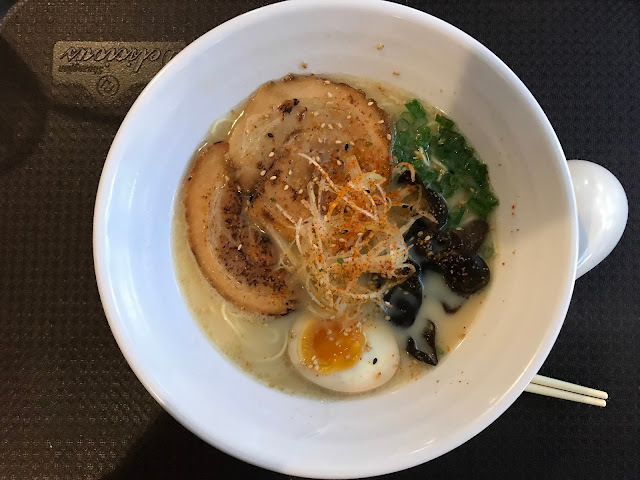 I was really excited to try the Signature Tonkotsu Ramen [$13 for Original; $13.50 for Spicy] but I was greatly disappointed. The noodles were a little soggy and the tonkatsu broth was bland. 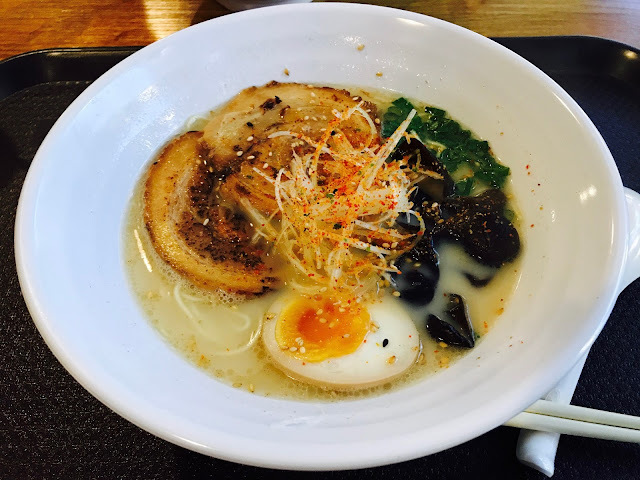 It’s a far cry from Ramen Keisuke Tonkotsu King or Ramen Dining Keisuke Tokyo. 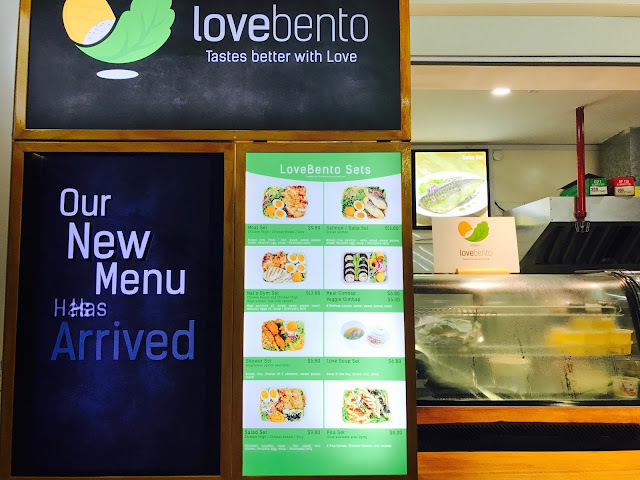 It’s all about healthy eating at LoveBento. 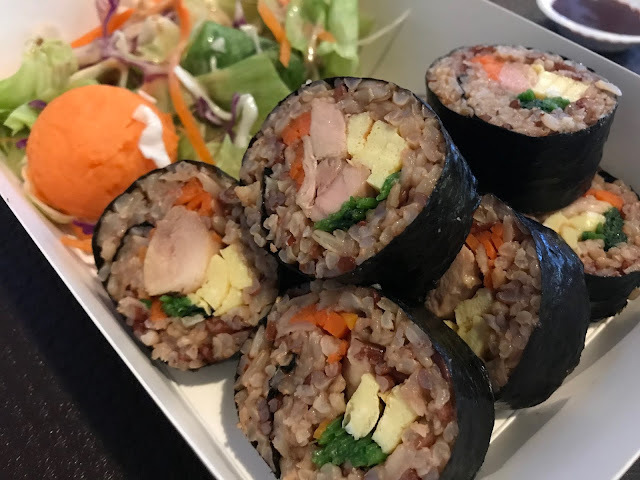 There is a mixture of cuisines, from Korean in Meat Gimbap [$6.80]/Veggie Gimbap [$6] to the Mediterranean in Pita Set [$6] which is only available after 2 pm. 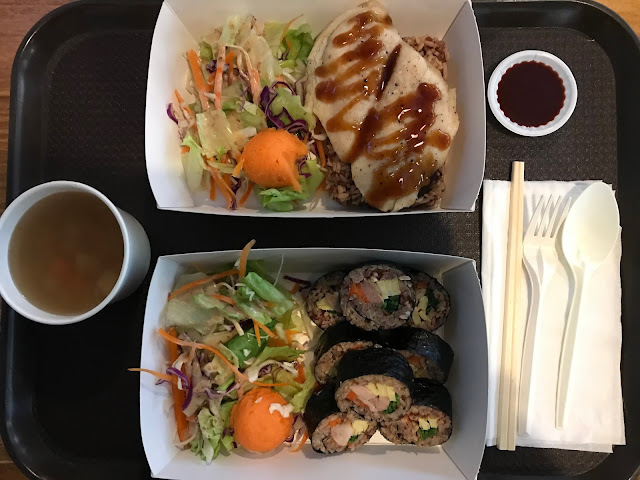 I have tried the Dory Set [$11.80] which consists of brown rice, a slice of dory with teriyaki sauce, salad, sweet potato mash, Hanjuku egg and soup. 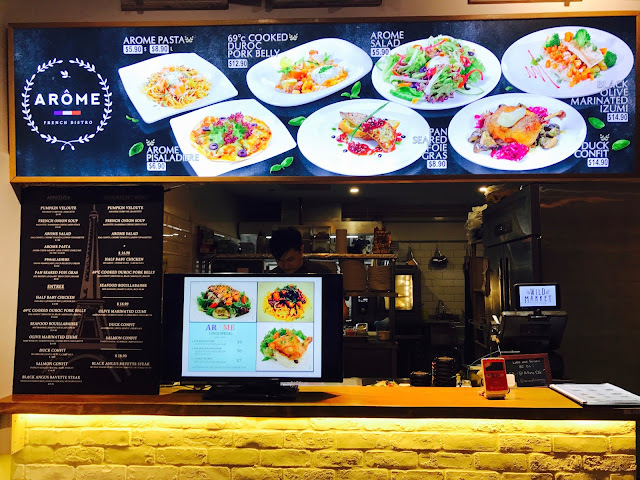 If you are one of those who is all about eating healthy, this is the stall for you. 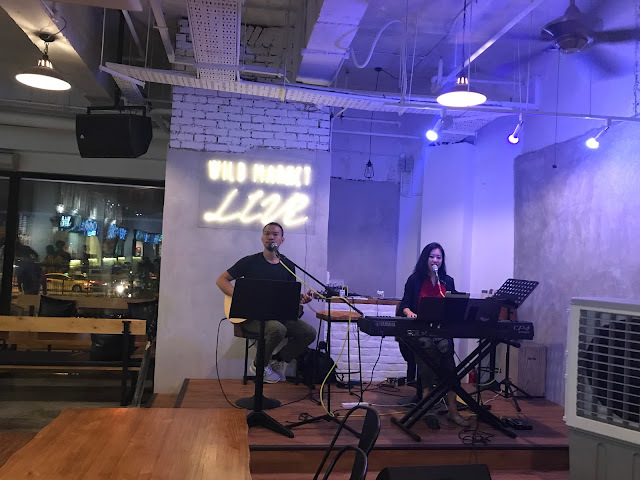 There is live band performance on weekend nights, coupled with alfresco outdoor sitting and Wild Bar that serves all alcoholic drinks from beer to wine, Wild Market is a great place to hang out with friends after work or during the evenings.